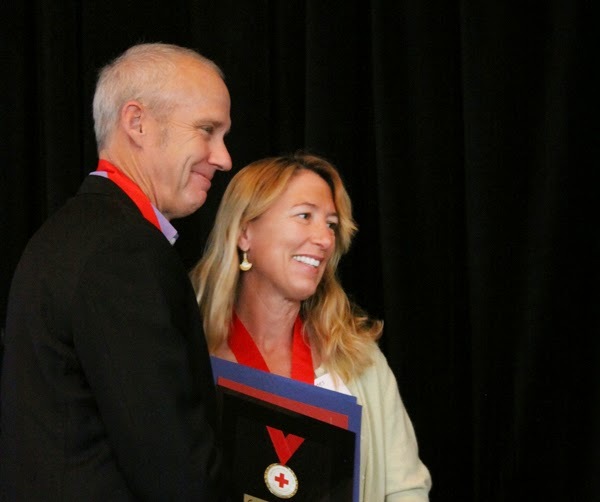 On April 30, 2014 we were honored to receive the Good Samaritan Heroes award from the American Red Cross for our years of volunteer disaster relief and support of educational programs for children in need. We also received Good Samaritan awards from the Ventura County Board of Supervisors; U.S. Congresswoman, Julia Brownley; California State Senator, Hannah-Beth Jackson; and, California State Assembly members Jeff Gorell and Das Willams. Mark and I received these awards on behalf of the volunteers and donors of the non-profit charity that we founded, the Kirwin International Relief Foundation (KIRF). We founded this 100% volunteer, donor-supported, and disaster survivor needs-directed charity after our lives were spared in the Andaman Sea tsunami disaster of 2004. After helping other survivors get aid during the tsunami disaster we realized being in a natural disaster is an awful experience but also that anyone can make difference if they wanted to. We realized that even a small thing like helping someone get connected with a family member overseas, or connecting them with a local leader who can get them food and water, or a roof over their heads, or building materials so they can re-build their fish farm, or a school scholarship for a little boy or girl orphaned by the disaster... can literally change a life and, sometimes, save a life. By working with locally respected community leaders in a disaster zone, assessing needs with them, and delivering aid with their help, we have proven repeatedly the value of the bottom-up, community-led disaster relief approach for Stage II disaster relief (also known as "disaster recovery"). The long process of disaster recovery occurs after the aid organizations and first responders are gone and it is up to the neighbors, local business owners, farmers, educators, health workers, spiritual leaders, and local secular leaders--the local people-- to work together to re-build. KIRF volunteers work with these local leaders for a sustainable relief that strengthens communities. We received these awards but they honor the efforts of every volunteer and supporter of KIRF's global network of local leaders and altruistic volunteers who help relieve suffering and help others have a better future. “We have the choice to use the gift of our life to make the world a better place--or not to bother." It's by Jane Goodall, DBE and I take it as an inspiration and a challenge.